Exterior detail at HIP at the Flashlight Factory. Photo by Francesca Dabecco. Nine years ago, Mitchell Schwartz and Elaine Stone were leaving a party at the Mattress Factory, making their way through the North Side, before arriving at the intersection of Brighton Road and W. North Avenue. “Normally, we would have turned to go west to the South Hills,” says Schwartz. “But I said, ‘Let’s go down that way, we never go down that way,’” Stone explains. So Schwartz zigged instead of zagged and there, on W. North Ave., they spotted a huge “for sale” sign draped over a massive four-story building called the Hipwell Flashlight Factory. The Flashlight Factory building today. Photo by Tracy Certo. Since then, that impromptu turn has served as a metaphor for all of Stone and Schwartz’s adventures at the Flashlight Factory — a reminder that one move can change everything. Interior event space photo courtesy of HIP at the Flashlight Factory. Starting in the late 1800s, the Hipwell Flashlight Factory — a 48,000-square-foot manufacturing building — produced many of the flashlights in America and even invented the first single-cell battery. But after closing in 2004, the historic building sat untouched for nearly five years. Today, after several years of renovating the industrial space (and with some renovations still underway), the building no longer clatters with the production of flashlights. 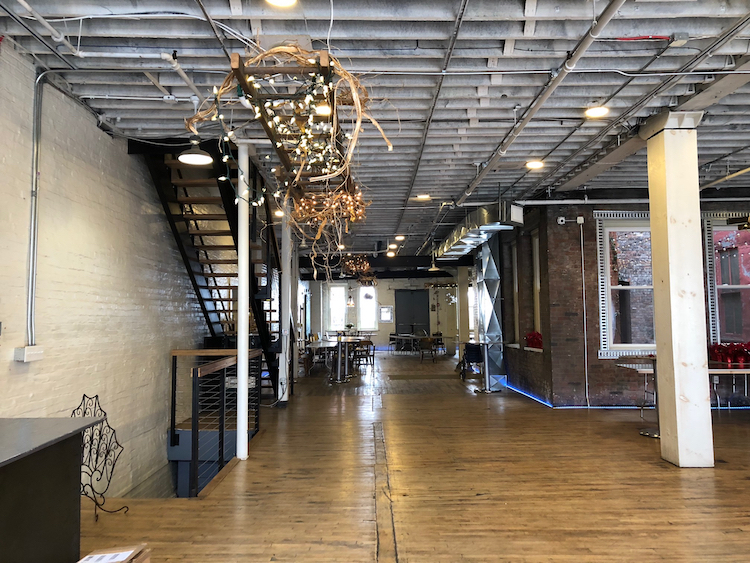 But it does shine in a new light, serving as loft apartments, a business headquarters and an event space called HIP at the Flashlight Factory. HIP at the Flashlight Factory interior event space. Photo by Tracy Certo. As entrepreneurs, Schwartz, 63, says it’s only fitting that he and his wife bought the industrial building (for $550,000) to house their audiovisual systems integration company, SMARTSolution Technologies, along with their own loft. Their living space features an open floor plan with large windows, repurposed garage doors serving as room separators and the showpiece — an old wooden diving board reborn as a kitchen island. “The entire kitchen was designed around that diving board,” Stone says. The kitchen, complete with repurposed diving board. Photo courtesy of HIP at the Flashlight Factory. 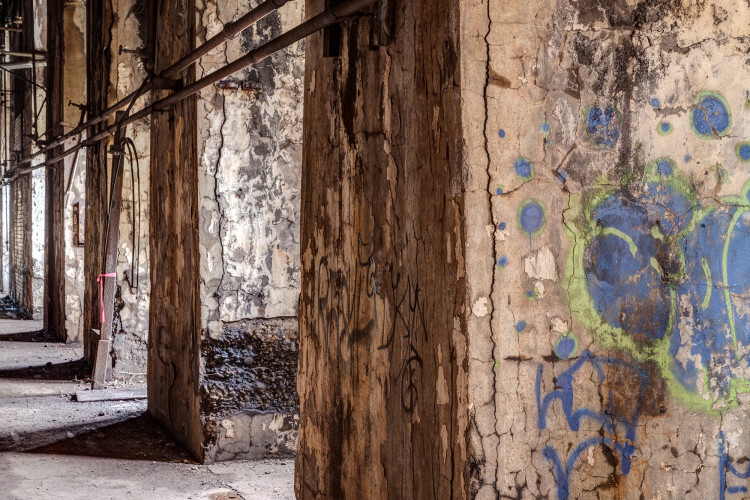 Throughout the rest of the building, they have repurposed everything from salvaged wood and organ pipes to ceramic sinks and barn doors. Not only does this provide interest in the design, Stone says, but it is both environmentally and economically friendly. The massive building also houses five loft apartments. One is home to Schwartz and Stone, and another is used by their son. A third is set up for people who book the event space and also want to rent overnight accommodations. The enclosed courtyard includes a hot tub for guests. Photo by Francesca Dabecco. The final two units are currently being remodeled, and will probably be available for rental eventually. No word yet on prices. 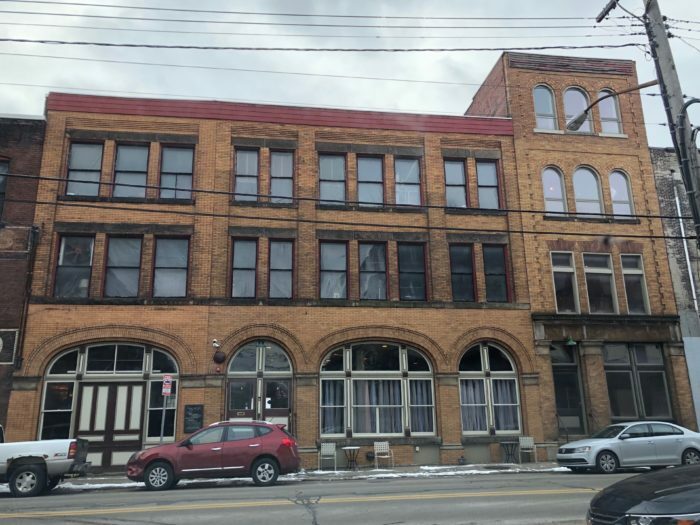 Though they’ve owned the building for nearly a decade, Schwartz and Stone did not use the Flashlight Factory as an event space until their daughter, Gracie, had her wedding there in 2017. For Stone and her husband, this was just a natural evolution of the building’s story — and their own. 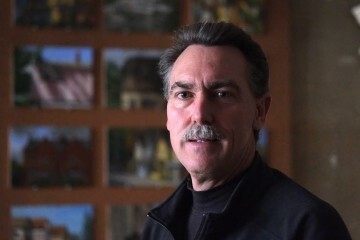 “I always had interest in party planning, in sort of creating a space,” says Stone, who spent years as a wedding photographer and has a knack for interior design. 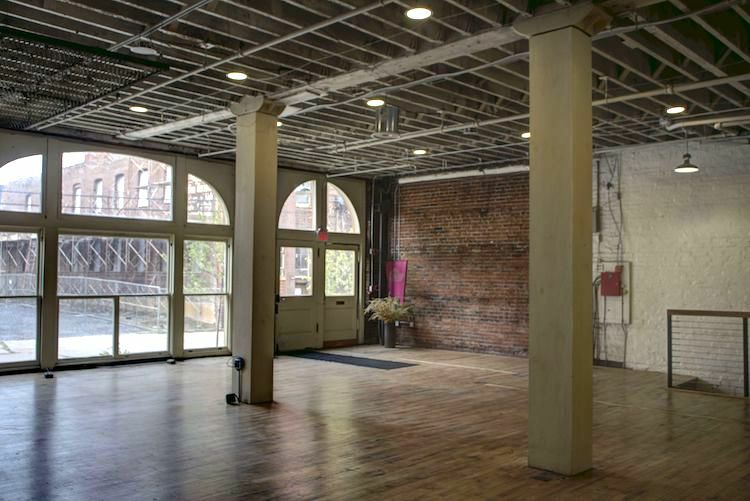 The 5,500-square-foot event venue includes two separate but adjacent long rooms, both featuring high ceilings, exposed brick walls and original hardwood floors. 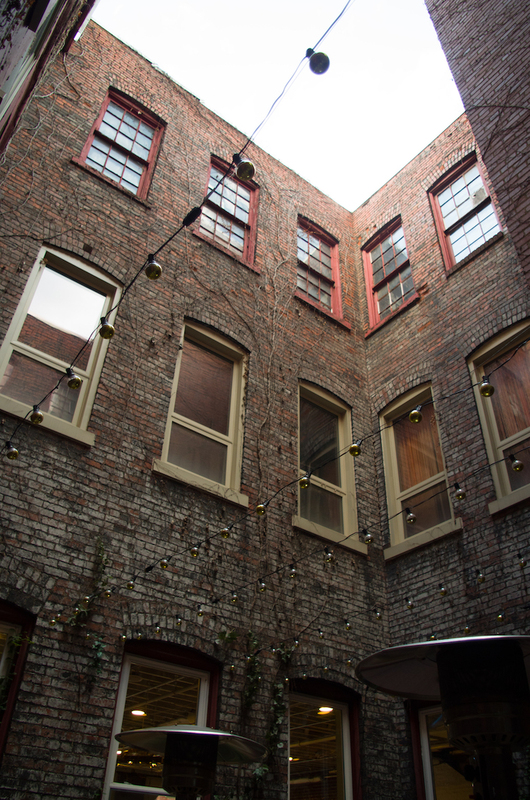 The building also features an enclosed courtyard adorned with a string of lights and a hot tub for guests. An old metal grate hangs from the ceiling serving as an unexpected art piece, factory sprinkler heads take the role of unconventional doorknobs and original Hipwell flashlights hang over the bar area as unique light fixtures. The vibe is tres industrial chic. “We’re all about repurposing and reusing,” says Gracie Schwartz, who explains that the name HIP at the Flashlight Factory is a nod to the past while looking to the future. The venue has hosted many weddings, showers and company parties, and coming up this weekend, will be the site of Quantum Theatre’s Q Ball. Schwartz notes that it’s available for weddings for an entire weekend, from rehearsal dinner Friday night to brunch on Sunday — and newlyweds can even book the available loft apartment upstairs. In keeping with the celebration theme, it’s called the Prosecco Room.